Today was our 8th day of school and we fully ran Daily Five today!!! I was so proud of my first graders! I think this may be the earliest I have ever felt like my kiddos could do it. We used our Smart Board to make our choices and I had kids reading to self, reading to someone, word work-ing, and listening to reading all at the same time. I've decided to wait on work on writing because I have so many kiddos that just aren't ready to be independent with that yet. Then, in the middle of our Daily Five greatness we had a fire drill! I was working with a kiddo on his DRA when it went off and the sound of the alarm literally made me jump. I think I totally scared my little kiddo! Oops!! 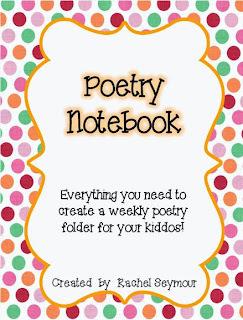 Something else I have already implemented in our classroom are our poetry notebooks. We had our kiddos bring 3 ring binders this year instead of using folders like I have in the past. I used my *FREE* Poetry Notebook pack for our binder cover, table of contents page, and poetry log. This next picture is the inside and I hate that it's upside down. I changed it when I saved it to my computer, but when I uploaded it here it went upside down. :( If anyone knows how to fix this I would love to know how!! The purple paper in the front pocket is the parent log. My kiddos take their poetry notebooks home every Friday and read their poems over the weekend. I don't require this, but I do highly encourage and reward it. This encourages reading at home over the weekend without officially assigning homework. Parents can sign the log one time each weekend. I don't care if my kiddos read 1 poem or 20 poems. Once the log is filled up my kiddos get Class Dojo points. The green paper attached to it is just an explanation for parents. The yellow paper is their table of contents page. We give each poem a page number and then we write the title and page number on the table of contents. It helps keep us organized. I gave my kiddos 3 copies of this page on the front and back because we fill up our notebooks with so many poems that I don't want to have to add more pages later. Love this freebie thank you!